As a buyer most real estate services are FREE. Not many people know this. When buying a home, the home seller pays the agent(s) commission. With that said there is no reason for a buyer to not hire a real estate professional. Purchasing a home consists of many tasks and legal contracts. Your real estate professional will take care of all of this at no cost to you. The only thing most agents want from a buyer is their commitment to work with them. This comes in the form of a Buyers Representation Agreement. You agree to work with the solely with that agent and the agent agrees to work on finding you a home and managing the transaction from start to close. 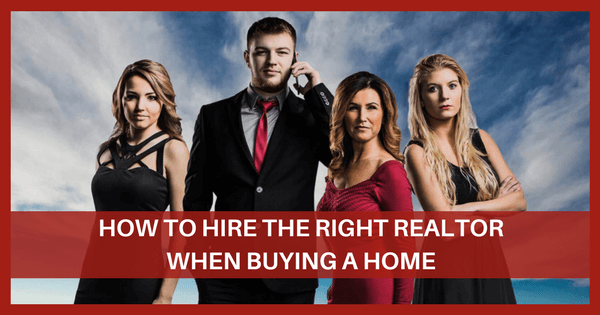 Why it is essential to hire the right Realtor when buying. A good real estate agent can make a world of difference. A good agent will have some tactics of finding you homes that may not be online or even on the market. A mediocre agent might just take a look at what's online and email you some listings every now and then. A good agent will establish good communication and promptly return your calls. You might hear from a mediocre agent every week or so. The first thing to understand while trying to find a real estate professional is all the different titles: agent, broker, Realtor®, etc. They are not all the same. A real estate agent is someone license to sell property, which usually means taking 100+ hours of course work and then passing a state real estate exam. A real estate broker is usually the real estate firms owner and can hire agents to work under him. In some states basic real estate agents are called brokers. A Realtor is an agent or a broker who is a member of the National Association of Realtors®. Realtors abide by a detailed code of ethics to treat their clients honestly and fairly. Consider it added insurance that they're committed to helping you. People shop online for everything these days, and finding a real estate agent can be just as easy. To locate ones in your area, use online tools such as Google.com. An agent that shows up in the search engines shows that they know what they are doing. Don't include the ads in this. Anyone can pay to be in the ads. Once you find a few agents that look good. Google their name and do some research, read their biography and maybe some testimonials of past clients. After you find a few that you like, call them up and schedule some interviews. Always remember to look into a few agents and make sure they're a fit for your needs. According to the National Association of Realtors, 52% of first-time home buyers found their Realtor through a friend, and 66% contacted only one agent. That would be like having your friend set you up on a blind date, and then marrying that person by Date 2. (Hello, ugly future divorce!) How can you be sure you made the right choice without looking around? Simple: You can't. Most people will interview different family doctors or different lawyers. So they should do the same for Realtors. If your wife's 3rd cousin twice removed happens to be a real estate agent, you may feel bad if you don't use them. If you don't, he might not want to sit next to you at Thanksgiving next year. ( which may not be a bad thing) Now ask yourself this. Do you really want him/her to know about your personal finance information? What happens if things go south in a transaction. This could end up being worse than not using them. And most importantly, is he/she even a good agent? Our solution to this family problem is very simple. It's called a referral. If you would prefer to hire us because you feel your wife's cousin won't be as serious, we would give them a referral. So you don't have to work with them but they still get a little money from the deal. This way no one can be mad. Thanksgiving has been saved! How long have you been in real estate? You may not need an agent with decades of experience under their belt, but less than a year of experience can be concerning. It takes time for agents to get their systems and processes in place. How long have you lived in this area? One exception to the previous question is if the agent has lived in the area for a long time. A newly licensed agent shouldn't be automatically removed from consideration. If the agent has lived in the area their entire life, it's likely they could know more about the area than an agent who has been in real estate for years but only recently moved to the area. Weigh overall experience against local experience when making your decision. Do you have a team, or do you work alone? Many solo agents are great, but an agent with a team is excellent. Working with a team is important, it increases response time and availability. Often, a solo agent has less time and may be over-booked. This can cause delays when you need their attention. What is your schedule? If they are not a full-time agent, you need to know when they'll be available. Or if the agent doesn't work on the weekends but that is the only time you can see houses. Time and schedule conflicts could make you miss out on a lot of properties. Do you have any vacations planned? People like to vacation and if they're heading out of the city anytime soon, make sure they have a back-up in case you find the perfect home while they're out of town.